You asked the question*, and now we know the answer. 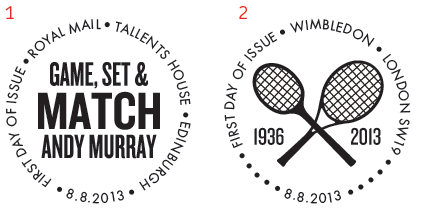 Royal Mail will mark Andy Murray Wimbledon Men's Singles Championship with an Olympic-style miniature sheet on 8 August 2013. This is the first in a new series of Special Stamp issues to honour our most successful sportsmen and women. "I'm still a bit old fashioned with soaking stamps off. The purple (value and line on sheet) runs very badly if you soak. When I asked the Philatelic Counter people in Edinburgh about this they had the cheek to say to me that "stamps are for postage and we don't check if they soak". Are they really saying this sheet is for Postage!??! Astounding!" On Sunday, 7th July Andy Murray beat the World Number One, Novak Djokovic, 6-4 7-5 6-4 in the Gentlemen’s Singles Lawn Tennis Final at Wimbledon to become the first British male to win the tournament since Fred Perry in 1936. To celebrate this tremendous achievement, which Andy himself described as the “pinnacle of tennis”, Royal Mail is issuing a Miniature Sheet on 8th August. The Miniature Sheet will contain four stamps each featuring a photo of the champion from the final itself including two in which he is triumphantly holding the coveted trophy. Also available with this special Miniature Sheet is a First Day Cover and Presentation Pack. The First Day Cover features photographs of Andy from the final while the Presentation Pack explores the progress of his tennis career from his first matches at Dunblane Sports Club, and includes a summary of his Wimbledon 2013 success. Official First Day Postmarks FD1324TH and FD1324PL - there will be others for sure. Following an internal reorganisation within the WSP group of companies, the group is now known as ISP. All future print references will reflect this and we have no plans to go down to the level of specifying the particular printing plant. - the four stamps are 2 x 1st class and 2 x £1.28 which pays the 40g airmail rate to Europe and the 20g rate to the rest of the world. - Royal Mail almost never issues special stamps at the surface mail rate, which is why there is no 78p stamp. - Royal Mail have said in the past that to be economically viable (ie worth the effort of processing stocking and processing it) the face value has to be at least £3.50 - which is why this mix of stamps is included and not 4 x 1st class. - Many people will be pleased with this stamp issue and Royal Mail clearly expect that it will be widely bought by tennis fans. They know that some collectors will be upset by yet another sporting miniature sheet showing a living person but they believe the business arguments in favour outweigh the arguments against. They no longer build the stamp issue programme around the collectors who buy one of everything. Finally.... don't shoot the messenger! Several people have reported that their Post Office branch received no FDCs for this issue. I have personally checked one sub-PO that still hasn't received any. I did find that Dereham crown office received them and sold most of their sheets early on the day of issue. * Paul Yarden comment on Dinosaur stamp issue! The Royal Mail website says “first in a new series of Special Stamp issues to honour our most successful sportsmen and women”. I wonder what the criteria will be? Will they be done retrospectively, ie for Bradley Wiggins winning the tour de France last year? Does the printing credit “International Security Printers” mean that Royal mail are no longer viewing Walsall & Cartor as separate entities, or is it that both printers are involved in this issue? I've already asked RM for clarification on the second point and will update when I know more. Not directly related to this issue but, will the Forest Stewardship Council certification codes be changing, or will they wait until they need renewing in 2014 (Walsall) & 2015 (Cartor)? I would expect the companies to keep their FSC certificates until they need renewing. Only the terminology has changed (to the parent company) - the constituent companies still exist as separate entities. Well done Royal Mail...amd so quick. I would imagine that retrospective issues will be the norm otherwise we could be waiting a long time for the next one. Mind you we might get another Ashes set before the end of the summer. Well for me I think it finally means that 2013 will be the closing point for my complete GB collection. Shame. Will there be any other postmarks with this issue? Do you know? Yeah, I suggested this last week. I am glad that Royal Mail didn't let me down on this one. Next week an announcement for Chris Froome? Best regards from a (tennis/sports) stamp collector from Holland (Edward). These stamps are generally good, and a well deserve outing. My only gripe more money to spend on a set for this year, and I thought RM were dumbing down to 12 issues per year. "sighs"
I like the idea, it will be interesting to see how it works in practice. Already we have Chris Froome, plus Justin Rose and hopefully Lee Westwood, then the Ashes boys and the Lions. Which ones 'deserve' a stamp and which ones don't. Good luck Royal Mail. Living persons - let's hope all of these Sporting Heroes maintain a clean nose for the rest of their lives. Imagine a 'Living Person' stamp for Jimmy Savile issued in his lifetime. Would the stamp still be saleable? hi there. Still a bit old fashioned with soaking stamps off. The purple (value and line on sheet) runs very badly if you soak. When I asked the Philatelic Counter people in Edinburgh about this they had the cheek to say to me that "stamps are for postage and we don't check if they soak". Are they really saying this sheet is for Postage!??! Astounding.